My 8th Yes show, and my second and last "double dip". 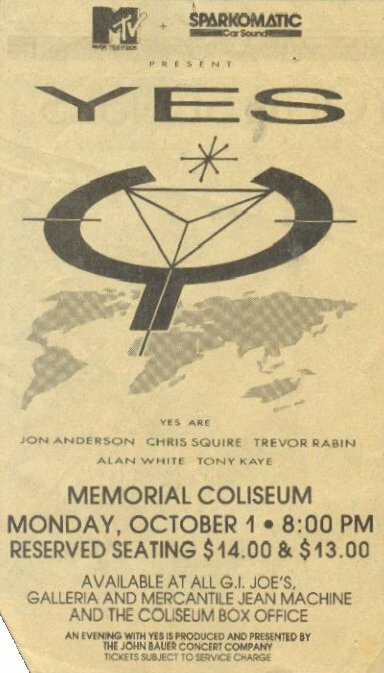 I had seen the show in East Rutherford, since were living in NYC at the time, but I was sent to a week of training in Portland, OR, and was able to catch this show with some friends out there. Musically it was every bit as good as the show I had seen in NJ, but I remember that there was some ordinance or something at the time in Portland, and the lasers were taped over. You could still see the pots moving with the music and such, but the mindblowing laser show that I saw in NJ was missing. It's all good though. What a performance. As already mentioned here, the rendition of the And You And I was crazy good. Also, another blistering rendition of Starship Trooper!!! I was a star struck 21 year old fan that was amazed that he was going to attend his first Yes concert. I hung out at the rear entrance of the Coliseum in hopes of catching a glimpse of the band before the show. Alan White showed up but looked very confused and disoriented. I've often wondered if this was the reason they took out a projector and showed us looney tune cartoons before the band finally took the stage? Jon Anderson did announce that this was their last tour date and a crew member came down a rope near the stage and he was shooting off a fire extigisher that shot white foam spray everywhere. I sat near the stage and towards the end, the guitar that Trevor was playing, broke a string. He was furious and yelled up a storm while handing the guitar to a tech hidden under the stage. The tech handed him a temp guitar and no one noticed the delay. Chris was all over the place pacing back and forth. It was evident he loved being up there. The highlight was the extra long jam on Wurm that just kept going and going. At times, the event resembled a WHAM concert. But the sound was fantastic and the solos were mindblowing. Trevor Rabin stunned the audience with his fretwork. Impressive show... I just wanted more of the old Yes. A few interesting notes pertaining to this show...As you know, Sparkomatic provided the tour programs (if you can call them that) but do you know they gave away bumper stickers? I have a couple and find it fascinating that YES would be so commercial!!! Oh well. I bought a t-shirt but it shrank immediately so I was able to wear it just a couple of times. I pulled it out of the bottom of my dresser and squeezed into for the UNION show and had a couple of people comment on it. That was the last time I wore it and I framed it in quilter rings. It hangs in my music room. Other than the Looney Tunes opening and the Gimme Some Lovin encore the show was essentially the same as the 9015live video. The Amazing Grace solo was stunning and the intensity of It Can Happen were highlights. I was unaware of additional musicians at that time. The one thing that does blast through the mists of time is the fact that Trevor really used a wide array of sound effects. To good effect I might add. As I recall, rather than an opening act, they played cartoons (much to the crowd's enjoyment).